You will need the following installed on your machine: Android Studio, React Native and Genymotion. You will also need an Android device, and a Pusher account. In this tutorial, we’ll create a ride hailing app(similar to Uber or Lyft) with React Native and Pusher. React Native will be used to create an Android app for both the driver and the passenger. Pusher will be used for realtime communication between the two. The clone that we’re going to create will pretty much have the same flow as any ride hailing app out there: passenger books a ride → app looks for a driver → driver accepts the request → driver picks up passenger → driver drives to destination → passenger pays the driver. The app determines the user’s location and shows it in a map (note: GPS needs to be enabled at this point). From the passenger app, the user clicks on “Book a Ride”. A modal will open that will allow the passenger to pick the place where they want to go. 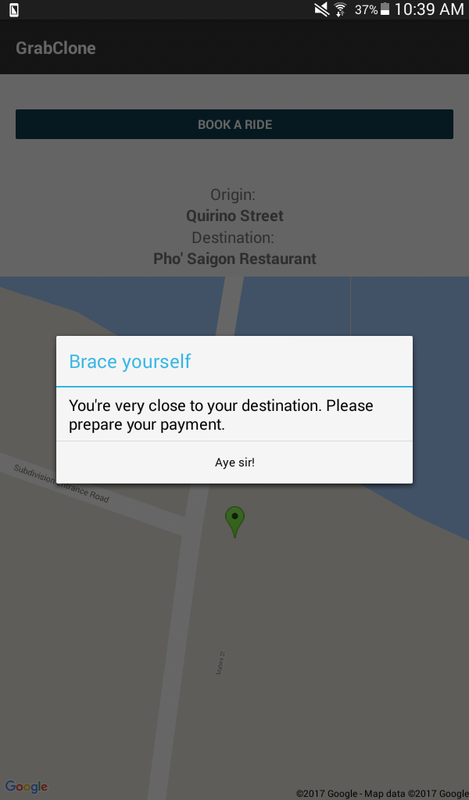 The app asks the passenger to confirm their destination. Once confirmed, the app sends a request to the driver app to pick up the passenger. A loading animation is shown while the app is waiting for a driver to accept the request. The driver app receives the request. From here, the driver can either accept or reject the request. Once the driver accepts the request, the driver’s details are shown in the passenger app. The passenger app shows the current location of the driver on the map. Once the driver is within 50 meters of the passenger’s location, they will see an alert saying that the driver is near. 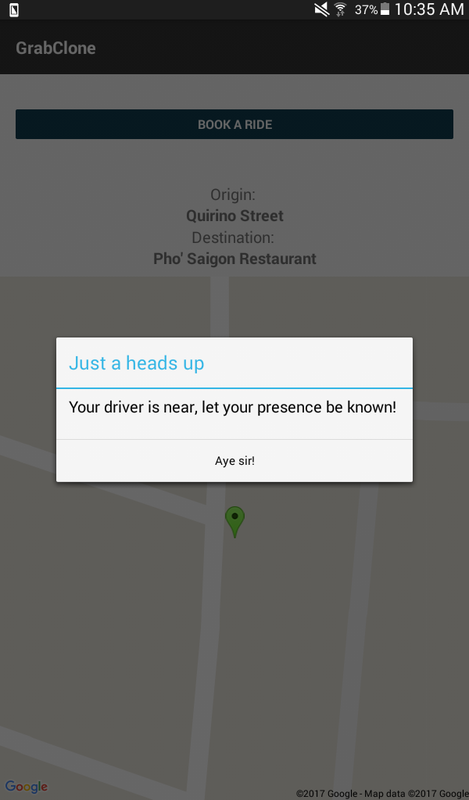 Once the driver is within 20 meters of the passenger’s location, the driver app sends a message to the passenger app that the driver is almost there. After picking up the passenger, the driver drives to their destination. Once the driver is within 20 meters of their destination, the driver app sends a message to the passenger app that they’re very near their destination. At this point, the ride ends and the passenger can book another ride. The driver is also free to accept any incoming ride request. Pusher Account - signup for a Pusher account or login with your existing one. 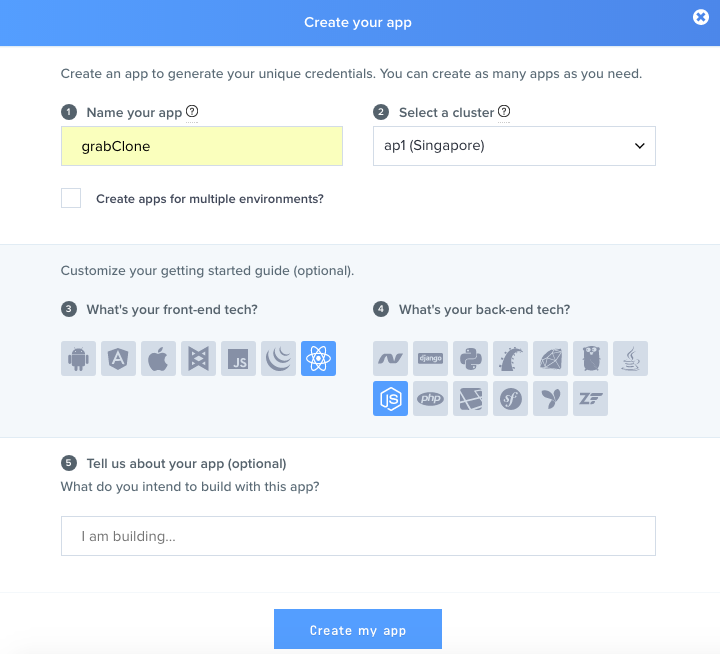 Once you’ve created an account, create a new app → select “React” for front-end technology → select “Node.js” for back-end technology. Next, click on the “App Settings” tab and check “Enable client events”. This allows us to have the driver and passenger app directly communicate with each other. Last, click on the “App keys” and copy the credentials. If you’re worried about pricing, the Pusher sandbox plan is pretty generous so you can use it for free when testing the app. Genymotion - for testing the driver app. We’re using this instead of the default Android emulator because it comes with a GPS simulation tool that allows us to search for a specific location and have it used as the location of the emulated device. 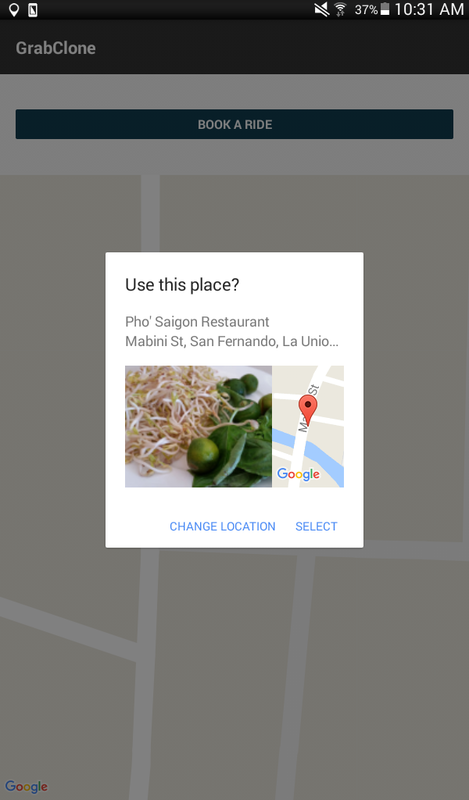 It uses Google maps as the interface and you can move the marker as well. This allows us to simulate a moving vehicle. Once Genymotion is installed, you need to login to your account in order to add a device. For me I’ve installed Google Nexus 5x for testing. Android Device - this will be used for testing the passenger app. You need Android 6.0 or higher. First, let’s work on the auth server. This is required because we will be sending client events from the app, client events requires the Pusher channel to be private, and private channels have restricted access. This is where the auth server comes in. It serves as a way for Pusher to know if a user that’s trying to connect is indeed a registered user of the app. Don’t forget to pass in the username when connecting to Pusher on the client-side later on. Access http://localhost:5000 on your browser to see if it works. 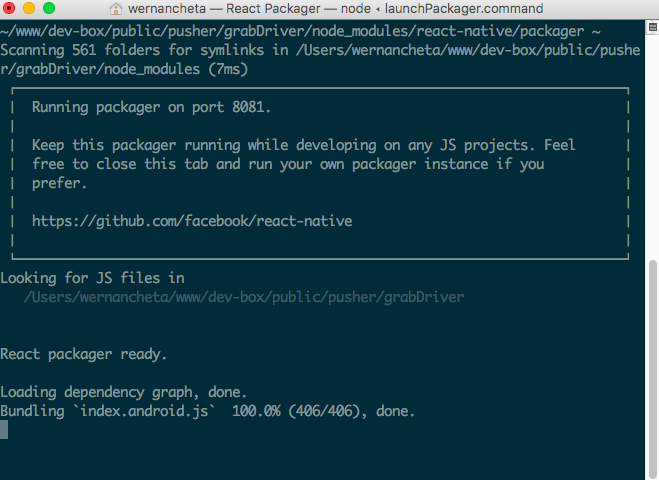 Once installed, you can now navigate to the folder where you have the server.js file and execute now. You’ll be asked to enter your email and verify your account. The deploy URL that now.sh returns is the URL that you’ll use later on to connect the app to the auth server. Next, you need to create a Google project, get an API key from the Google developer console, and enable the Google Maps Android API and Google Maps Geocoding API. 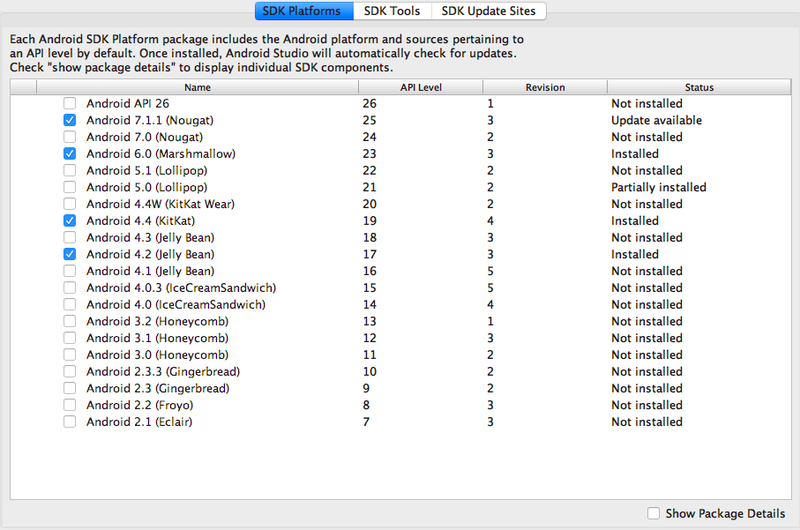 After that, open the android\app\src\main\AndroidManifest.xml file in your project directory. Under the <application> tag, add a <meta-data> containing the server API key. While you’re there, add the following below the default permissions. This allows us to check for network status and request for Geolocation data from the device. Also make sure that it's targeting the same API version as the device you installed with Genymotion. As I’ve said earlier, if its version 23 or above you won’t really need to do anything, but if its lower than that then it has to be exact for the app to work. Lastly, since we’ll be primarily using Genymotion for testing the driver app, you need to follow the instructions here. We need to do this because the React Native Maps library primarily uses Google Maps. We need to add Google Play Services in order for it to work. Unlike most Android phones which already comes with this installed, Genymotion doesn’t have it by default due to intellectual property reasons. Thus, we need to manually install it. If you’re reading this sometime after it was published, be sure to check out the Installation docs to make sure you’re not missing anything. What this does is importing the App component which is the main component for the app. It is then registered as the default component so it will be rendered on the screen. These functions are used for getting the latitude and longitude delta values needed by the React Native Maps library to display a map. The other function (getLatLonDiffInMeters) is used for determining the distance in meters between two coordinates. Later on, this will allow us to inform the user’s whether they’re already near each other or when they’re near their destination. Before the component is mounted, connect to the auth server that you created earlier. Be sure to replace the values for the pusher key, authEndpoint and cluster. Now that you’ve connected to the auth server, you can now start listening for requests coming from the passenger app. The first step is to subscribe to a private channel. This channel is where all passengers and drivers subscribe to. In this case, its used by drivers to listen for ride requests. It needs to be a private channel because client events can only be triggered on private and presence channels due to security reasons. You know that it’s a private channel because of the private- prefix. Next, listen to the client-driver-request event. You know that this is a client event because of the client- prefix. Client events don't need server intervention in order to work, the messages are sent directly to from client to client. That’s the reason why we need an auth server to make sure all the users that are trying to connect are real users of the app. Going back to the code, we listen for client events by calling the bind method on the channel that we subscribed to and passing in the name of the event as the first argument. The second argument is the function that you want to execute once this event is triggered from another client (from anyone using the passenger app to request a ride). In the code below, we show an alert message asking the driver if they want to accept the passenger. Note that the app assumes that there can only be one passenger at any single time. Once the driver agrees to pick up the passenger, we subscribe to their private channel. This channel is reserved only for communication between the driver and the passenger, that’s why we’re using the unique passenger username as part of the channel’s name. Not unlike the available-drivers channel, we’ll need to listen for when the subscription actually succeeded (pusher:subscription_succeeded) before we do anything else. This is because we’re going to immediately trigger a client event to be sent to the passenger. This event (client-driver-response) is a handshake event to let the passenger know that the driver they sent their request to is still available. 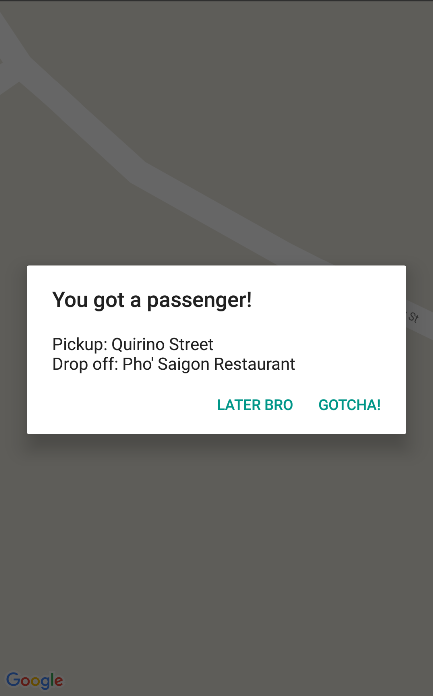 If the passenger still hasn’t gotten a ride at that time, the passenger app triggers the same event to let the driver know that they’re still available for picking up. At this point, we update the state so that the UI changes accordingly. 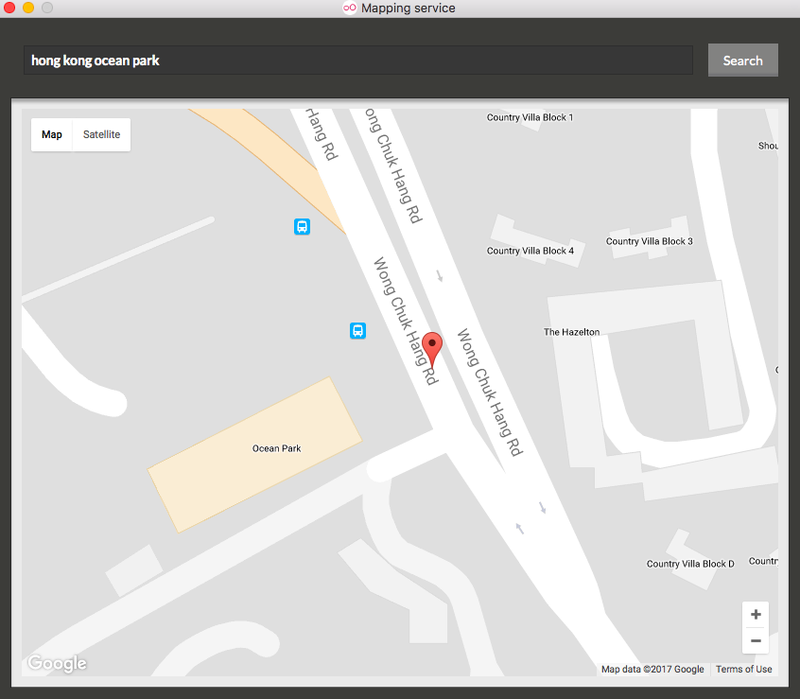 Next, we use the Geocoding library to determine the name of the place where the driver is currently at. 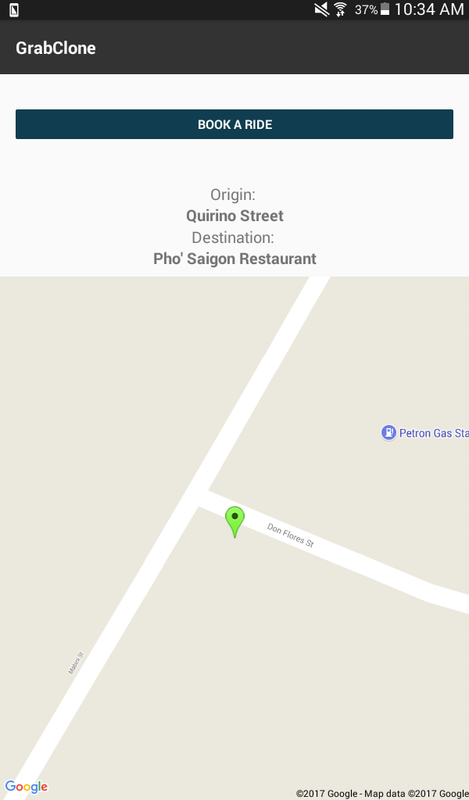 Behind the scenes, this uses the Google Geocoding API and it usually returns the street name. Once we get a response back, we trigger the found-driver event to let the passenger know that the app has found a driver for them. This contains driver info such as the name and the current location. Once the component is mounted, we use React Native’s Geolocation API to watch for location updates. The function that you pass to the watchPosition function gets executed everytime the location changes. 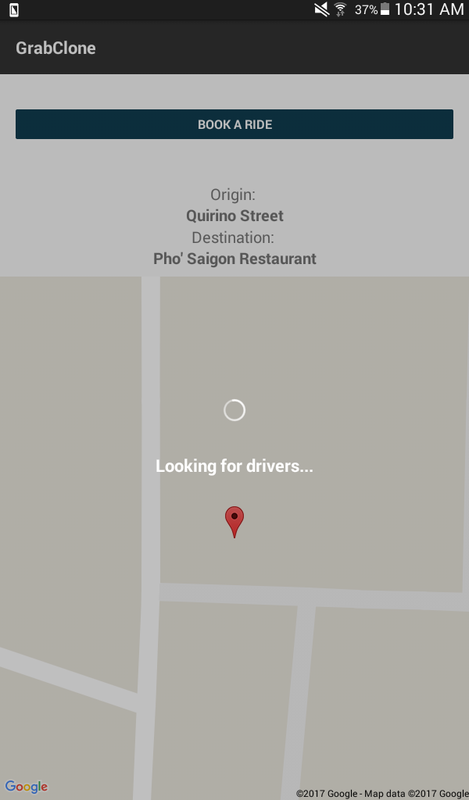 Next, send the driver’s current location to the passenger. This will update the UI on the passenger app to show the current location of the driver. You’ll see how the passenger app binds to this event later on when we move on to coding the passenger app. Next, we want to inform both the passenger and the driver that they’re already near each other. For that, we use the getLatLonDiffInMeters function from the helpers.js file in order to determine the number of meters between the passenger and the driver. Since the driver already received the passenger location when they accepted the request, it’s only a matter of getting the current location of the driver and passing it to the getLanLonDiffInMeters function to get the difference in meters. From there, we simply inform the driver or the passenger based on the number of meters. Later on you’ll see how these events are received in the passenger app. At this point, we assume that the driver has picked up the passenger and that they’re now heading to their destination. So this time we get the distance between the current location and the drop-off point. Once they’re 20 meters to the drop-off point, the driver app sends a message to the passenger that they’re very close to their destination. Once that’s done, we assume that the passenger will get off in a few seconds. So we unbind the events that we’re listening to and unsubscribe from the passenger’s private channel. This effectively cuts the connection between the driver and passenger app. The only connection that stays open is the available-drivers channel. msg: "You're very close to your destination. Please prepare your payment." The UI for the driver app only displays the map and the markers for the driver and passenger. 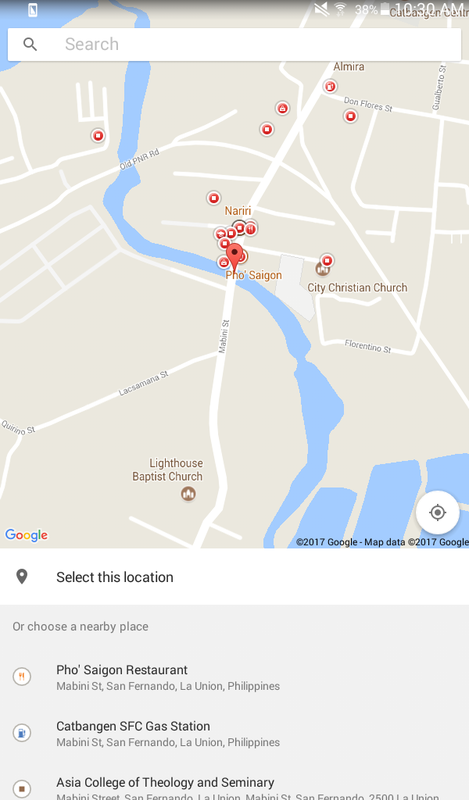 The other two libraries are Google Place Picker and Loading Spinner Overlay. Though we’ve used a fork of the Google Place Picker because of a compatibility issue with React Native Maps that wasn’t fixed in the original repo yet. Since we’ve installed the same libraries, you can go back to the section where we did some additional configuration in order for the library to work. Come back here once you’ve done those. Add the library that you just imported under the getPackages() function. While you’re there, also make sure that the MapsPackage() is listed as well. 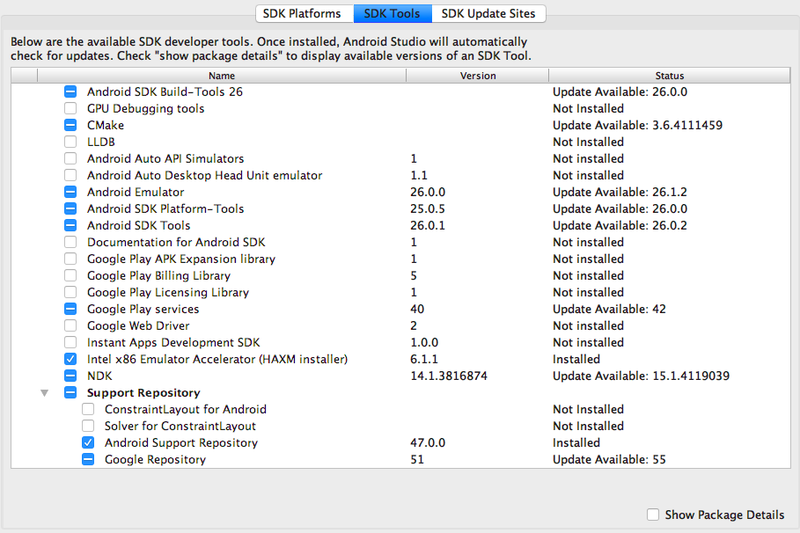 Just like the driver app, it also uses App.js as the main component. Go ahead and import the libraries. It also uses the same helpers.js file so you can copy it from the driver app as well. The bookRide() function gets executed when the user taps on the “Book Ride” button. This opens a place picker which allows the user to pick their destination. Once a location is picked, the app sends a ride request to all drivers. As you have seen in the driver app earlier, this triggers an alert to show in the driver app which asks if the driver wants to accept the request or not. At this point the loader will keep on spinning until a driver accepts the request. 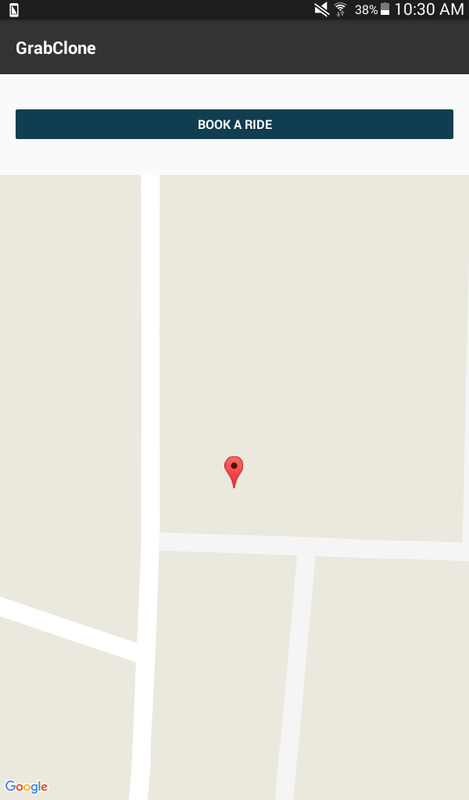 The _setCurrentLocation() function gets the passenger’s current location. Note that here we’re using getCurrentPosition() as opposed to watchPosition() which we used in the driver app earlier. The only difference between the two is that getCurrentPosition() only gets the location once. When the component mounts, we want to set the current location of the passenger, connect to the auth server and subscribe to the two channels: available drivers and the passenger’s private channel for communicating only with the driver’s where the ride request was sent to. Next, add the code for listening to the handshake response by the driver. This is being sent from the driver app when the driver accepts a ride request. This allows us to make sure that the passenger is still looking for a ride. If the passenger responds with “yes” then that’s the only time that the driver sends their information. The driver sends their information by triggering the client-found-driver event. As you have seen in the driver app earlier, this contains the name of the driver as well as their current location. Next is the event that is triggered on specific instances. It’s main purpose is to send updates to the passenger regarding the location of the driver (near_pickup ) and also when they’re already near the drop-off location (near_dropoff). The UI composed of the loading spinner (only visible when the app is searching for a driver), the header, the button for booking a ride, the passenger location (origin) and their destination, and the map which initially displays the current location of the user and then displays the current location of the driver once a ride has been booked. Now you’re ready to run the app. If you have two machines, this will allow you to enable logging (console.log) for both. But if you have only one machine then you have to run them in particular order: passenger app first and then driver app. This will compile, install and run the app on your device. Once its running, terminate the watcher and disconnect your device from the computer. Next, open Genymotion and launch the device that you installed earlier. This time, run the driver app. Once the app runs you’ll see a blank screen. This is normal because the app needs a location in order to render something. You can do that by clicking on “GPS” located on the upper right-side of the emulator UI then enable GPS. Once you’ve selected a location, the map UI in the app should show the same location that you selected. Next, you can now follow the steps on the App Flow section earlier. Note that you can emulate a moving vehicle by clicking around the Genymotion Map UI. If a passenger has already booked a ride and the driver has accepted the request, it should start updating both the passenger app and the driver app of the current location of the driver. If you’re using two machines, then you can simply run react-native run-android on both. One should be connected to your device and the other should have the Genymotion emulator open.